A list of links and resources of current events and ongoing projects happening around our region. King County Wastewater Events Page – Free events offered around the county related to wastewater and sustainable land management. Be sure to check out upcoming wastewater treatment plant tours at the West Point and Brightwater treatment facilities. 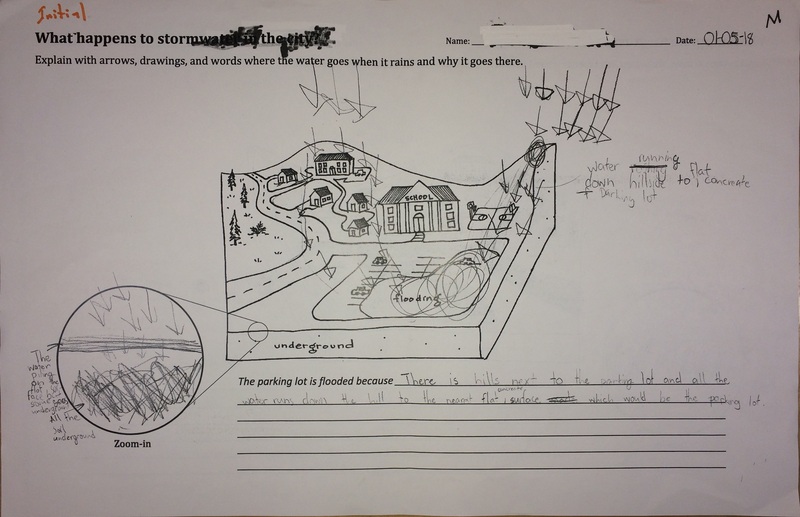 Delridge Wetlands Project – The Delridge Neighborhood Development Association is leading a project to restore a wetland along Longfellow Creek in the Delridge neighborhood of Seattle. 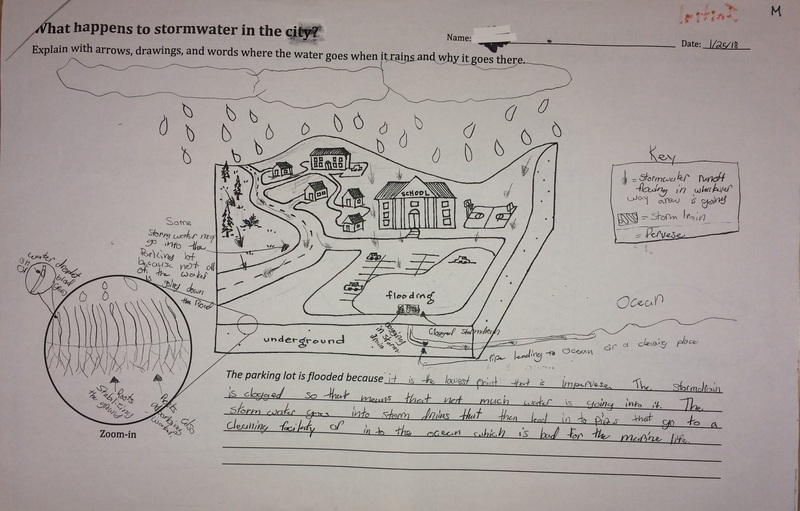 In addition to stormwater control and water quality improvement, this space will also provide an urban garden, a community gathering space, and an outdoor classroom for students from nearby schools. Recovery of Southern Resident Orcas – In March of 2018 Governor Jay Inslee issued Executive Order 18-02 creating the Southern Resident Orca Task Force to study the causes of orca population decline as well as explore possible recovery strategies. Pollution carried by stormwater runoff affects the water quality of local streams and rivers, which decreases salmon populations. Southern resident orcas rely on salmon as a food source and are, therefore, impacted by polluted stormwater runoff. Roxhill Wetland Restoration Project – Created by the Westwood Roxhill Arbor Heights Community Coalition (WWRHAH) this project aims to restore the Roxhill Bog and protect the headwaters of Longfellow Creek in southwestern Seattle. Bogs and other wetlands naturally filter and slow stormwater, which helps prevent pollution and flooding in our local streams and creeks. Beavers as Nature’s Ecosystem Engineers – Beavers are making a comeback across Washington State, especially in urban and suburban streams. In this video created by KCTS 9 Molly Alves, a wildlife biologist with the Tulalip Tribes, explains how the Tribes are using beavers to restore streams in the Mount Baker-Snoqualmie National Forest. Beavers and their dams create salmon habitat by slowing stream flows and creating pools suitable for salmon. In Seattle beavers can help slow stormwater runoff through our urban waterways and have been sighted in our urban streams such as Longfellow and Thornton Creeks. 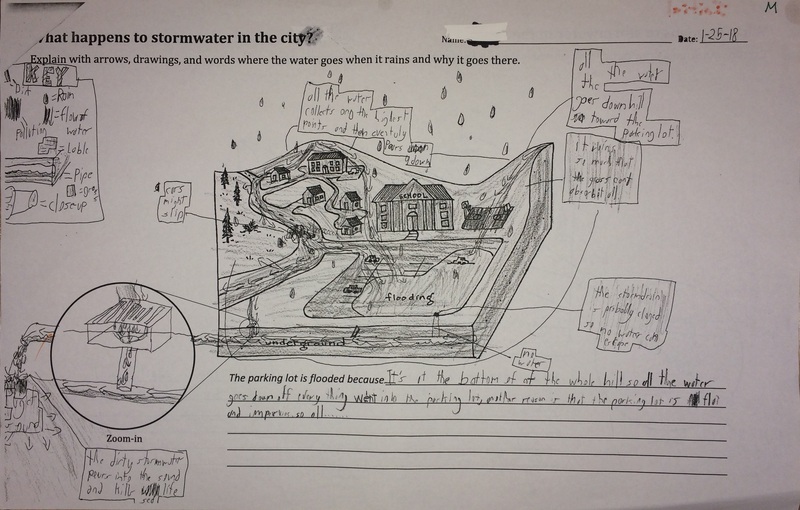 Seattle Rain and Climate Change – An article published last year by City Lab describes how climate change will increase the frequency of extreme storm events in western Washington and what Seattle can do to prepare for increased stormwater. Another article by Yale Climate Connections describes how extreme rainfall events may increase across the country. Snowpack in the Pacific Northwest – A new study by Oregon State University indicates that, while snowpack levels across the region have remained steady in recent year, they are likely to significantly decrease in the near future due to global warming. Warmer winters could mean less snow and more rain, leading to increase stormwater and flooding in the Puget Sound area. Decreased snow pack could also mean less snowmelt feeding our streams during the summer, posing a risk to our drinking water reservoirs as well as wildlife such as salmon and orcas. Environmental Health Risks Map – A new interactive map created by the University of Washington’s Department of Environmental and Occupational Health Sciences displays pollution exposure and social vulnerability across Washington State. This map illustrates the nested impacts of environmental and social issues in our state, particularly within urban areas. Urban watersheds often bear the brunt of this pollution due to increased stormwater runoff from impervious surfaces like roads and highways. Green Cities: Good Health – This database created by the University of Washington and the U.S. Forest Service compiles peer-reviewed research related to the health and social benefits of urban green spaces, including Green Stormwater Infrastructure (GSI). Nature’s Scorecard – Created by Puget Soundkeeper and the Washington Environmental Council this scorecard tracks the progress made by local cities and counties to create “walkable, green, and healthy communities.” Through their advocacy all Washington cities and counties are now required to have Low Impact Development principles and practices written into their National Pollutant Discharge Elimination System (NPDES) permits, which regulate how municipalities manage their stormwater runoff. 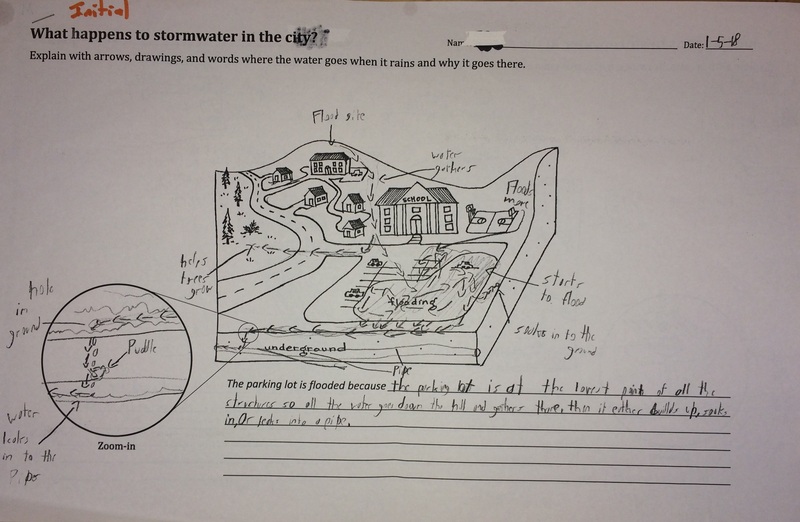 In lesson 1 students demonstrate prior knowledge by creating an explanatory model of where stormwater goes in the city. 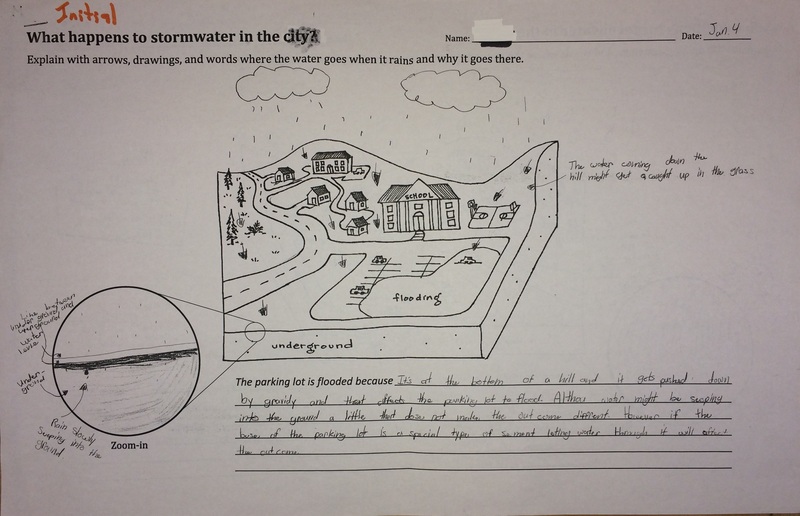 Students can use arrows, drawings, and writing to explain what they think happens to the rainwater when it falls on the area shown. The “zoom in” can be used to show more detail or how something (like roots or soil parts) might be working. 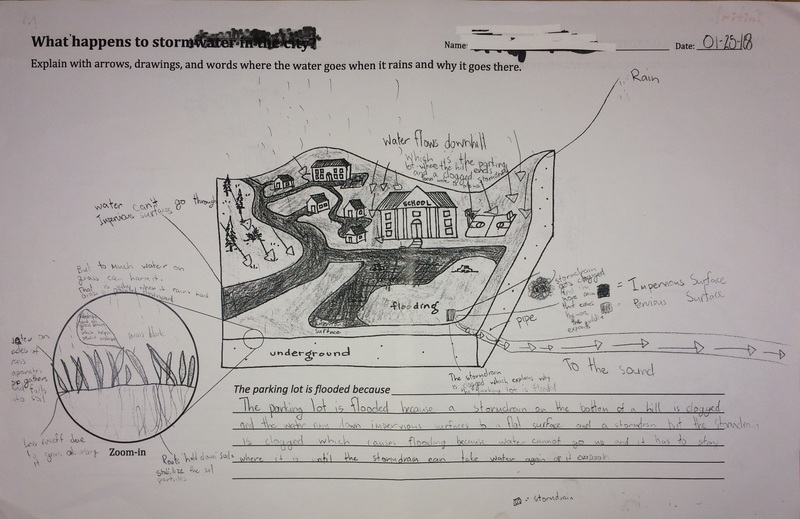 This is a working model for the students to refer back to throughout the unit. 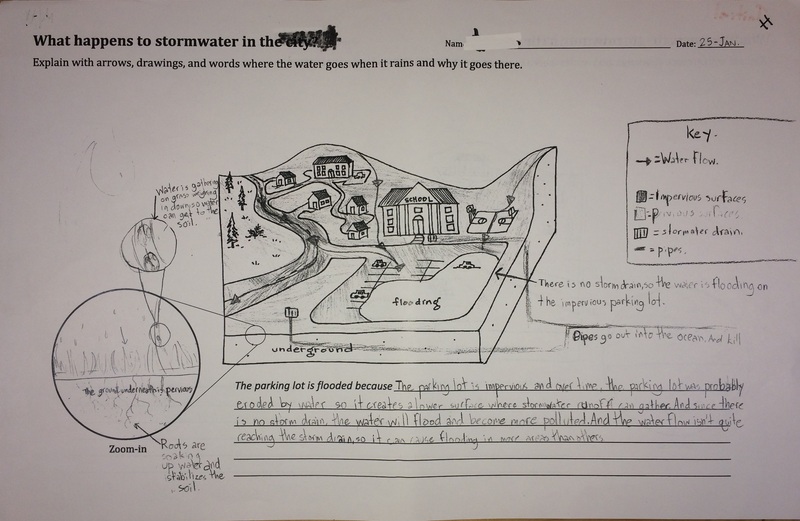 As their understanding grows they can add to this model or start over. 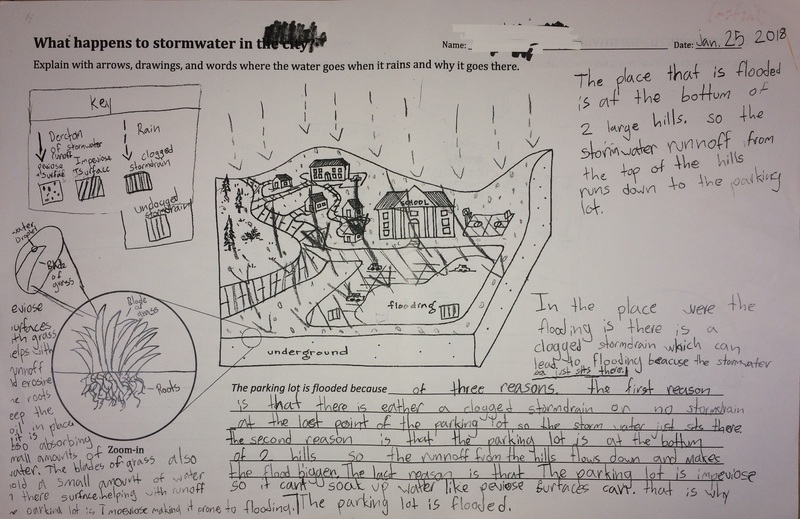 here are a few examples of student models created at the beginning of the unit and later on, with additional information added. 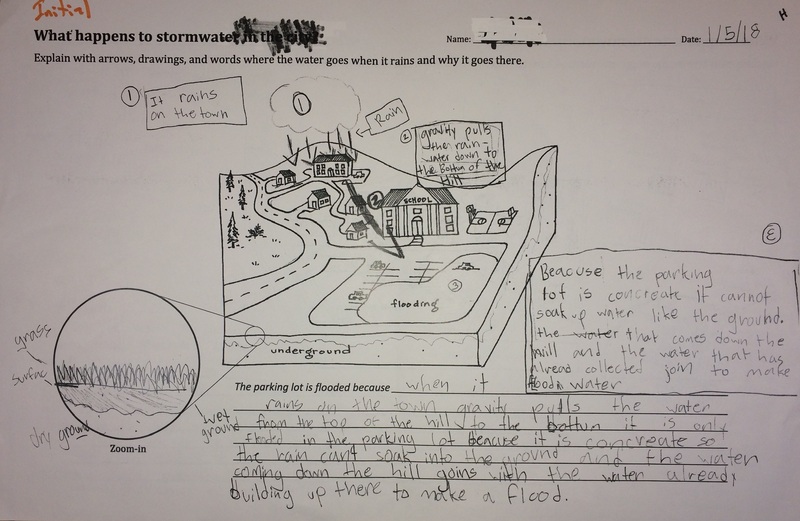 Students’ initial models often refer to storm water concepts yet lack proper vocabulary. Recreated models often incorporate these new terms. 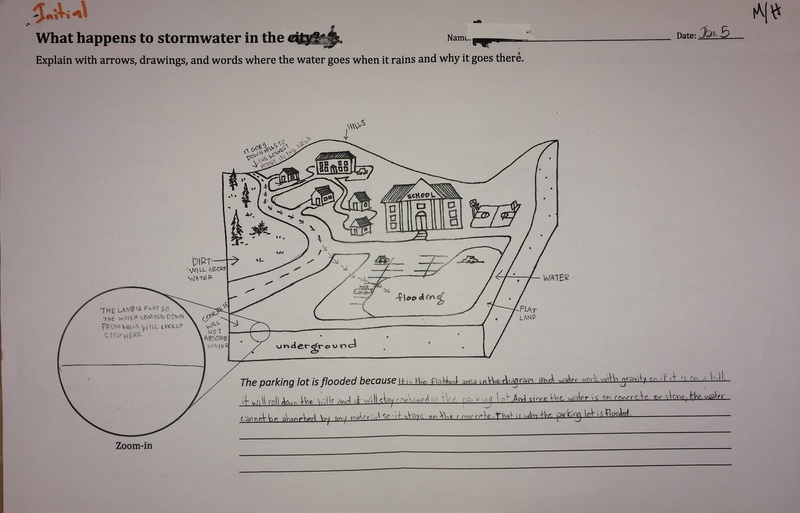 Some initial models may have misconceptions that you may want to address throughout the unit.